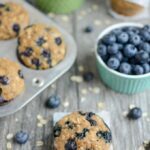 These Blueberry Muffins are lightly sweetened and bursting with flavor. They’re kid-friendly and make a great breakfast or snack! In a large bowl, mix together butter, egg, yogurt, vanilla and sugar until well combined. Add flour, oats, baking powder, baking soda and cinnamon and stir until just combined. Scoop in greased or lined muffin tins. Fill the tins most of the way full – you should get 7-8 muffins. Press a few berries into the top of each muffin (if desired) and sprinkle lightly with sugar. Feel free to use frozen blueberries instead – just toss in a little flour before mixing them in! Use oil and non-dairy milk to make them dairy-free.